Proud Uncle David . . .
My brother Jim and sister-in-law Karen headed down to Hartford, CT this week to watch my nephew (their son) Bud play at the Civic Center. 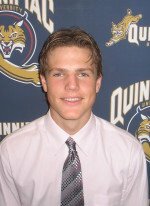 They were rewarded as Bud led the Quinnipiac Bobcats to a 5-2 win over Harvard. It was a magical evening for the Quinnipiac University men's ice hockey team on Friday night. With `Mr. Hockey', Gordie Howe, in attendance, the No. 20 ranked Bobcats defeated No. 15 Harvard in the program's first-ever ECAC Hockey League game, 5-2. A Quinnipiac home record crowd of 5,049 was on hand at the Hartford Civic Center to enjoy in the celebration. The Bobcats have now won seven in a row and are 7-2, 1-0 in ECACHL action. Harvard is 1-1, 1-1 in league play. Quinnipiac struck first just 1:12 into the game. Chris Myers' shot from the left wing went wide of the cage, but the ricochet caromed right to David Marshall in the right circle. Marshall fired a one-timer into a half-empty cage for his seventh goal of the year. Dan Henningson also assisted on the goal. Harvard had an answer just 2:05 later when Mike Taylor scored to tie the game. The Crimson held a 15-5 advantage in the shot department in the first period, but goalie Bud Fisher stopped 14 of those shots to keep the game even at 1-1 through the opening 20 minutes. Quinnipiac took the lead for good at the 2:19 mark of the middle frame. Reid Cashman's shot from the point was stopped, but Ben Nelson was right on the doorstep to knock in his fourth goal of the season. Brian Leitch was also credited with an assist on the goal. Marshall added his second of the night at 9:57 of the period to make it 3-1. Off a faceoff in the right circle, he pushed the puck towards the goal before roofing a shot for his ECACHL leading eighth goal of the year. Harvard trimmed the deficit to within a goal at 2:12 of the third period on a goal from Dan Murphy. Quinnipiac put the game away with a 5-on-3 power play goal at 14:56. Cashman set up Mark Van Vliet for a one-timer in the right circle, sending the crowd into a frenzy. Myers also assisted on the score. The Bobcats tacked on an empty netter for good measure when Michael Bordieri sped ahead of the field at 19:41 for his second of the year. The goal came off an assist from John Kelly. Fisher finished with 35 saves on the evening to set a new career-high. The Bobcats' special teams played a key role in the win. Quinnipiac scored twice with the man advantage and also killed off 11-of-12 Harvard power plays. Quinnipiac returns to action tomorrow night at 7 p.m. when it takes on Dartmouth at the Northford Ice Pavilion.